Most important, the T4220 has a single, bidirectional hinge that is a first for a convertible and a major convenience breakthrough. When you want to switch between the tablet and notebook forms, you can swivel the screen right or left on its hinge--no worries about having to double-check a directional arrow or twisting the screen the wrong way on the first try. Fujitsu continues to expand their Tablet PC line with an assortment of new machines including the The new Fujitsu T4220. The Lifebook T4220 Tablet PC is a eye pleasing silver with a white keyboard and a matt black top. It weighs in at 4.9 lbs with the Modular Dual-Layer Multi-Format DVD Writer installed. (4.3 with the weight saver) Built to meet the needs of the business man/road warrior who is always on the go in mind everything about the T4220 feels strong and sturdy, including the bi directional hinge that allows you to turn the screen in either direction. Fujitsu's new T4220 Tablet PC is running Windows Vista Business and comes with Microsoft Office OneNote 2007 installed. Five pre configured base options and the ability to customize each of them to suit your personally needs makes it easy for everyone to order their new Fujitsu Tablet PC with the options and extras best suited to their needs. The Fujitsu LifeBook T4220 is designed to weather outside use better than your typical convertible tablet laptop PC. And the Fujitsu LifeBook T4220 tablet PC has a nice keyboard and performs well, too, all at a competitive price. 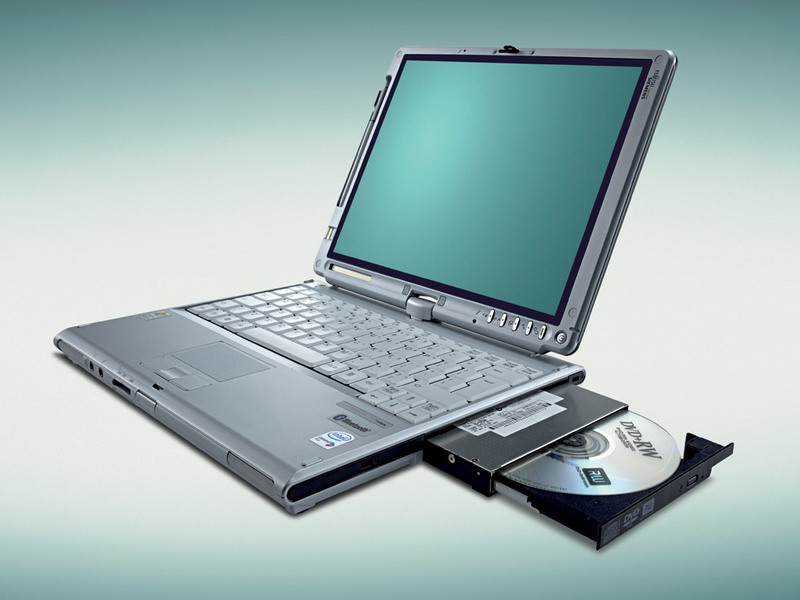 This successor to the LifeBook T4020 offers several improvements. The Fujitsu LifeBook T4220 tablet PC series now uses Intel's Santa Rosa processor line, and the hard drive, sealed before, is now user upgradable. Most important, the Fujitsu LifeBook T4220 tablet PC has a single, bidirectional hinge that is a first for a convertible and a major convenience breakthrough. When you want to switch between the tablet and notebook forms, you can swivel the screen right or left on its hinge - no worries about having to double-check a directional arrow or twisting the screen the wrong way on the first try. 80% Fujitsu's latest convertible Tablet takes full advantage of Intel's new Centrino technology, and it shows. The new Fujitsu LifeBook T4220 is a travel-friendly, well-rounded convertible Tablet PC that suffers from a few flaws. When it comes to computing horsepower and video quality, the newest addition to the LifeBook line reaps the benefits of Intel's Next-Generation Centrino Processor Technology (codenamed Santa Rosa), but its battery life left us wanting more.